Be the first to share your favorite memory, photo or story of Richard "Dickie". This memorial page is dedicated for family, friends and future generations to celebrate the life of their loved one. 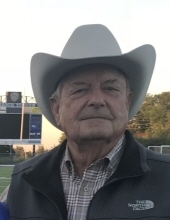 Richard Lee Rogers, age 77 of Breckenridge, passed away Tuesday, January 29, 2019. A memorial service will be held at 11 a.m., Friday, February 1, 2019 at 1st United Methodist Church with Matt Hall officiating. Visitation we are held Thursday, January 31, 2019 from 6 p.m. to 7 p.m. in the Chapel of Memories at Melton-Kitchens Funeral Home. Matt Hall officiating. Private burial ONLY for immediate family. Donations can be left at the funeral home office. "Email Address" would like to share the life celebration of Richard "Dickie" Lee Rogers. Click on the "link" to go to share a favorite memory or leave a condolence message for the family.